I have been lucky enough to be included on this trip as a volunteer with Museums Victoria – helping CSIRO sample for deep-sea microplastics on the Australian abyssal plain. This is the first time such a study has been done in Australian waters, and my first time on a proper research ship – the food is awesome! 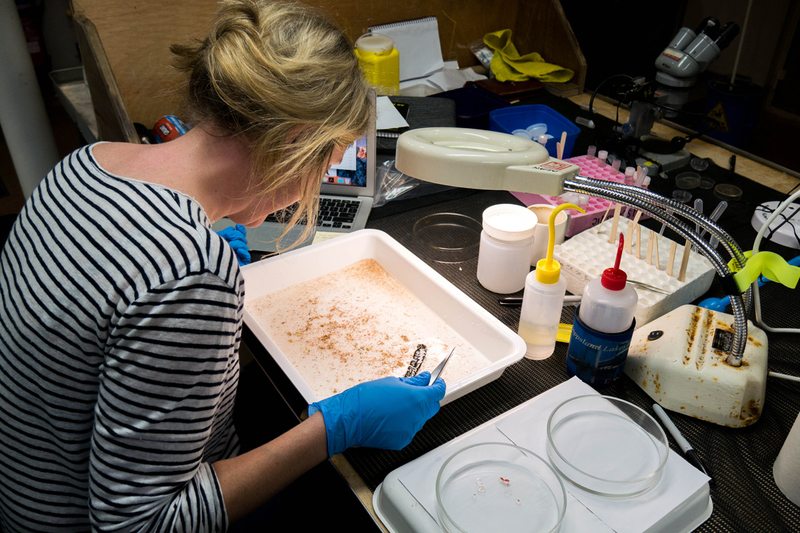 Results from this research is to be combined with environmental samples collected last year by CSIRO and the RV Investigator in the Great Australian Bight and will be key to gaining a better understanding of microplastic pollution in Australian waters. Tiny plastic particles – ‘microplastics’ – are not uncommon on beaches all around Australia. Can you think of a time that you went to the beach recently and didn’t see at least one piece of rubbish? You may have heard of the great ocean accumulation zones or ‘garbage patches’: at last estimate, the world’s oceans contain some 5.25 trillion pieces of plastic particles. That number is so big that it’s hard to get your head around. Surface concentrations of floating plastic have been measured in various ocean basins during the past 30 years, but until recently the extent of microplastics in the deep ocean was an unknown. From the few studies available, microplastics have been found in deep-sea sediments from the Atlantic Ocean, Mediterranean Sea and south-west Indian Ocean, up to orders of magnitude greater than contaminated surface waters. It’s a worry that our rubbish is contaminating an environment we have never even been to!There has been significant accumulation of microplastics in surface waters around Australia, but microplastics is a term for a very specific type of plastic debris – so what are they and where do they come from? ‘Microplastics’ typically refers to plastic particles less than half a centimetre (<5 mm). They can either be directly released into the environment from industrial abrasives, pre-production pellets (‘nurdles’), or as microbeads from facial scrubs, body washes and even toothpaste. Other sources of microplastics are secondary – from the breakdown of larger plastic items released into the environment (think coffee cup lids, bread tags and toothbrushes as an example). This can also include so-called biodegradable plastics (items designed to fragment into smaller pieces, faster). 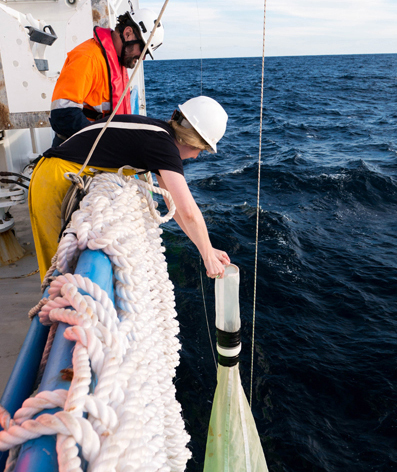 Being a part of this abyssal research on the RV Investigator offers a unique opportunity to sample for microplastics in deep-sea sediments relevant to Australia. 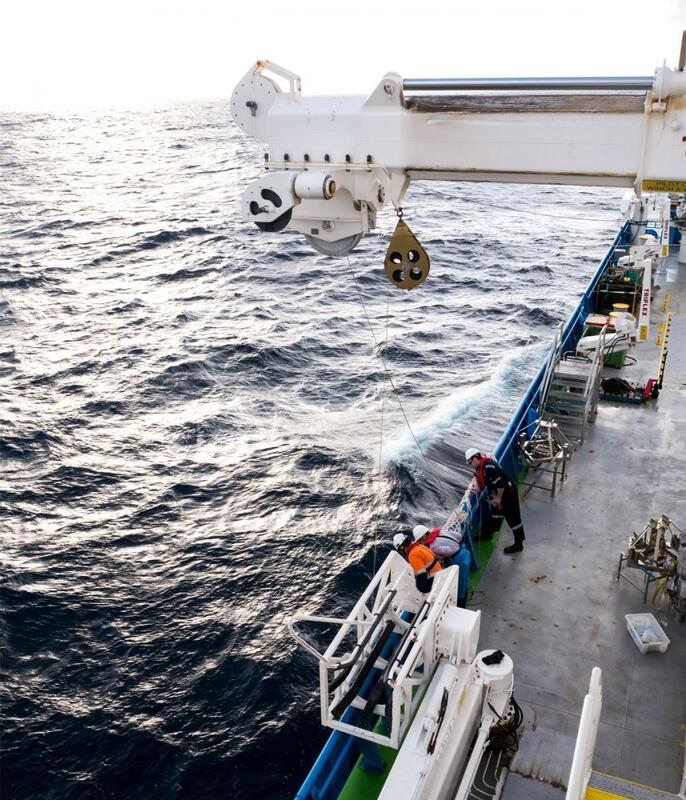 The project is led by CSIRO’s Dr Denise Hardesty and on this research voyage we are taking sediment samples from 2500–4000 metre depths along the abyssal plain from Tasmania up to the Coral Sea. We will be comparing these results with surface-trawls for microplastics taken from the same sites. 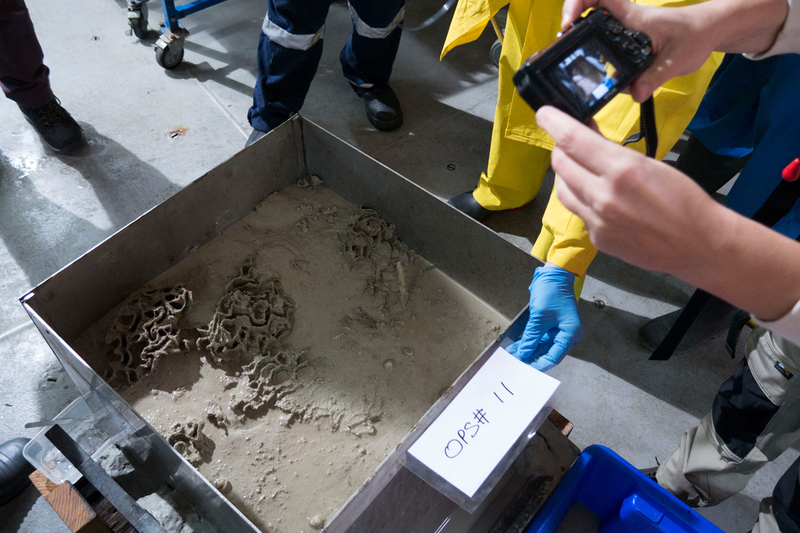 The sediment samples are collected from the box corer: when it brings up a small (0.25 square metre) chunk of seafloor we take sub-samples from the mud, leaving the cool creatures for the biologists to look at. But I definitely help to clean it out – there is so much mud, it’s awesome. The samples are stored to send to CSIRO when we reach land, and they will be processed for microplastics back in a specialised lab. 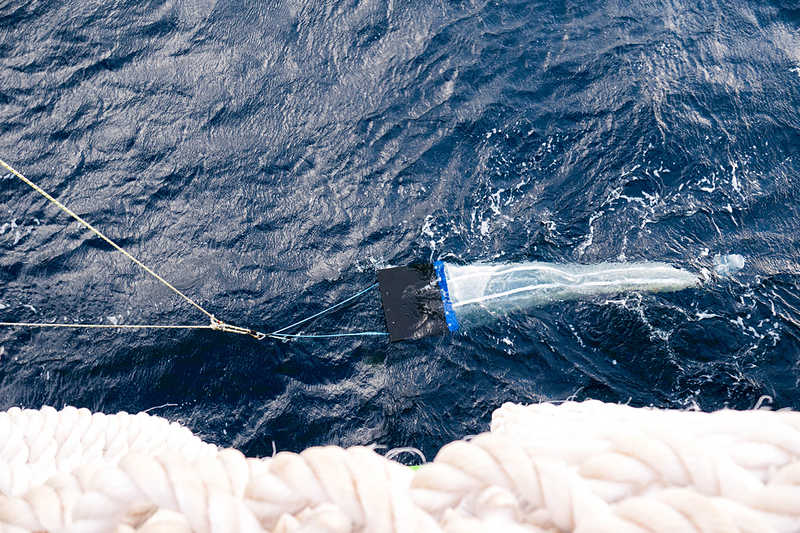 The surface trawls are also great fun, and done using a manta net that the amazing crew here help me to run off the side of the ship. It looks kind of like a manta ray and the opening of the net is designed to catch plastic particles at the ocean’s surface – not just microplastics though, some other gems I have ended up with include old Band-Aids and cigarette butts. 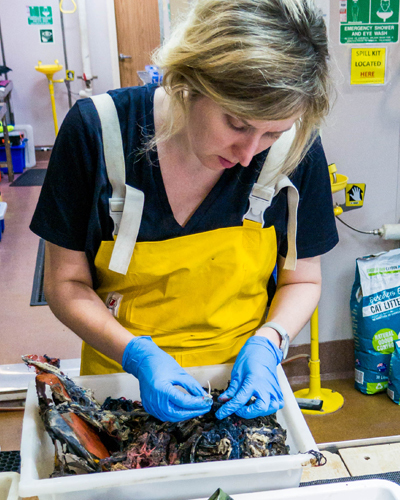 I can’t help but feel slightly jealous of the other scientists getting to work with amazing creatures while I get . . . garbage. Oh well, there is always still breakfast!! 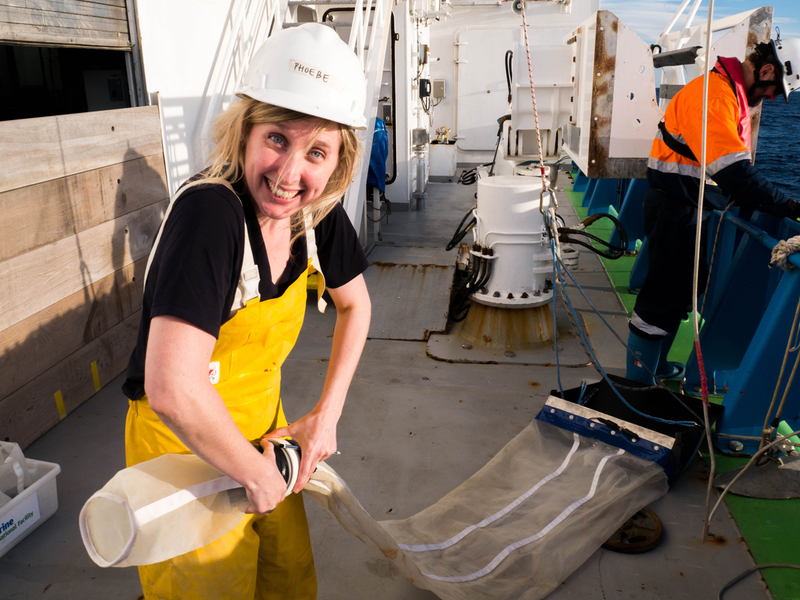 These manta net samples are processed on-board by me – a hilarious experience in rolling seas – trying to grab the tiny particles out of my tray with tweezers as the sample rolls back and forth in front of me. We have just left our Newcastle site and are headed up the coast into some rough weather, so I may have to suspend my processing for now…a perfect opportunity for another snack!